Back for year 2! 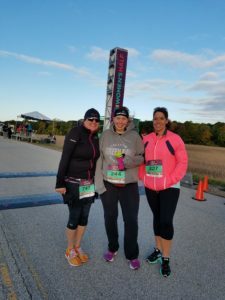 After last years inaugural Bellin Women’s Half Marathon, we all decided that this was going to be a must do event for us each year! This year, Linda and her race crew once again pulled out all the stops and made this event even better than year 1! 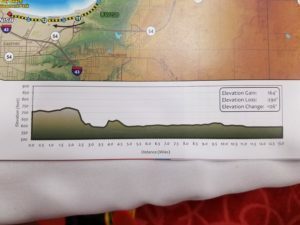 While there is not a short race option, this half marathon also features a relay for those that want to participate, but are not up to running 13.1 miles yet. This has become a very popular option, and a good way to get families running together. This is a race that is a weekend long experience to celebrate, motivate and empower women. Starting with an amazing expo and welcome celebration on Friday night, the race on Saturday morning and then an post-race dance party downtown! Yes, this is a women’s half marathon, but men are still welcome to run! I know of several men who were running with their wives, girlfriends, coworkers etc as motivation and pacing support! 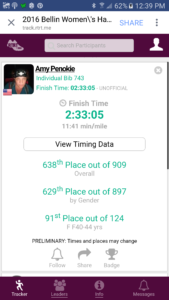 One friend of mine ran the half marathon, while her husband and daughter teamed up to run the relay together! Once again, the festivities kicked off downtown Green Bay at the KI Center. Here, packet pick-up and a boutique style race expo greet you. Anything and everything running related – and geared towards women! 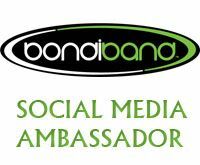 Both years, I was actually there early since I was working the expo for Bondi Band, so I usually got an early peek at all the goodies that were available. It’s probably a good thing that I was working, otherwise I would probably spend way too much shopping every year! 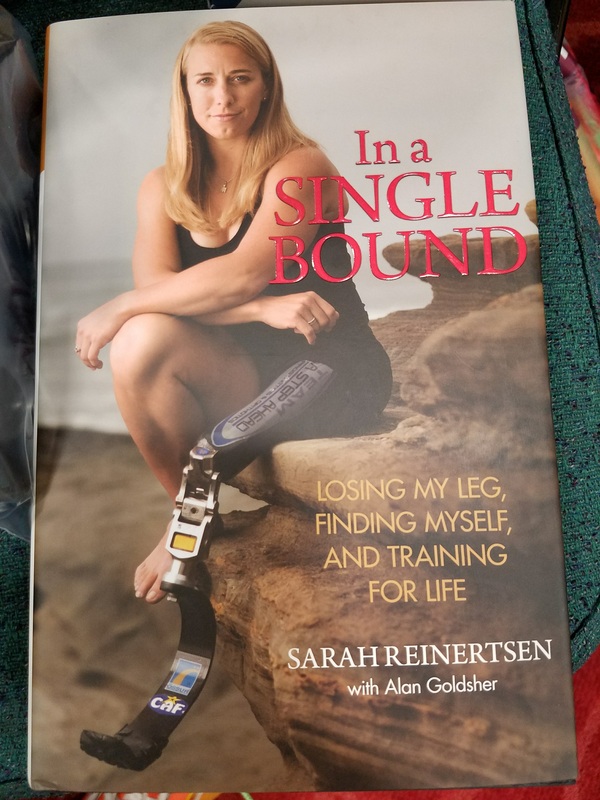 For me, the highlight of the expo this year, was having my Bondi Band booth right next to the booth where Sarah Reinertsen was hanging out for the afternoon, chatting with runners, signing autographs and taking pictures before she was the Inspiration speaker at the welcome dinner. For those of you who are not familiar with Sarah, she was the first female amputee to finish IronMan Championship in Kona HI and was also on the Amazing race! Yes of course I bought her book! Sarah is one of the sweetest, most down to earth women I have ever met! Just being able to hear all of her stories was amazing! I could have sat there all day chatting with her and listening to all of her adventures! But of course, since I was working, I had to be happy with what I got! And yes, she really is that tiny! I am 5’5″ and I felt like I was giant standing next to her! But she packs some punch into that small frame of hers and I am positive that she could run, swim and bike circles around just about all of us! One of the drawbacks of working the expo is that I always end up missing the pasta dinner and inspirational speaker. Thankfully my dear friend Lisa hooked be up with dinner! The staff at the KI was nice enough to get her a to go box to fill with dinner for me so that I could at least use my dinner ticket! Pasta, chicken, salad… just what I needed after working all day! After the presentations, all I heard from everyone that came back down to the expo afterwards was that Sarah was amazing. Well, yeah. I already knew that! I was bummed that I missed her presentation, but I was also blessed to have been able to spend some time with her in the afternoon! 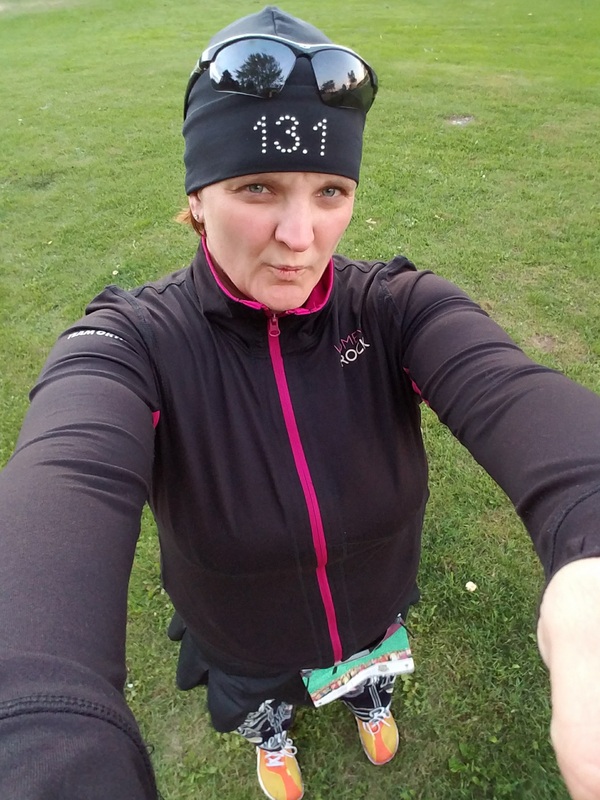 Once again, this year all participants received a super soft long sleeve, light-weight hoodie (these are my go to shirts on cool spring and summer days) and a custom race headband. I was super excited this year to see that they were Bondi Band headbands!! YAY!!! The final piece of swag is a drawstring bag. Now, this is NOT one of those cheap flimsy nylon ones that you get at most races that are screen printed with the race logo. This is a heavier duty bag printed with artwork by a local artist! 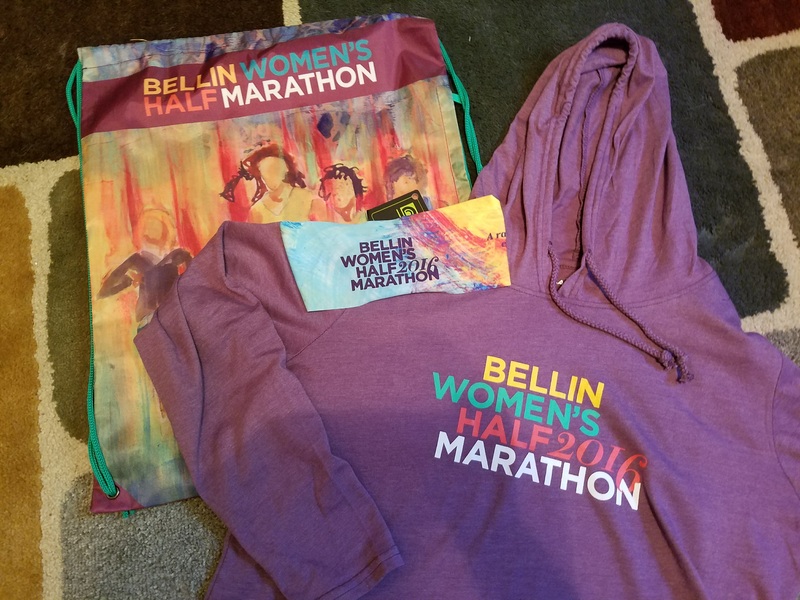 They had a contest and the winning artwork was sent home with every runner on their bag! Plus these bags has zippers on each side that open up to a “hidden” pocket in the front of the bag, so you have the main, big pocket for all you gear and then a zippered pocket in the front to stash keys, snacks or whatever else you want to be able to grab easily! Since there is very limited parking at the park, they run shuttle buses from the hotels downtown, as well as from the finish line (Bay Beach Amusement Park). Be prepared to be on a shuttle early so that you have ample time to get yourself ready to run! There are gear check buses at the start line, which will then move to the finish so your stuff will be waiting for you! This year, we were all wishing for the beautiful fall day that we had last year. Instead when I woke up, it was 39 degrees. Yes, 39 degrees! 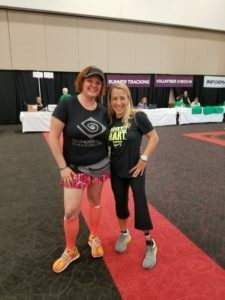 Just the day before I ran to get lunch before the expo started and I was wearing a running skirt and long sleeve shirt. I had previously picked out the perfect outfit for the day (of course it was Skirt Sports, head to toe!) and figured I could add a pair of arm warmers to the ensemble and I would be ok. 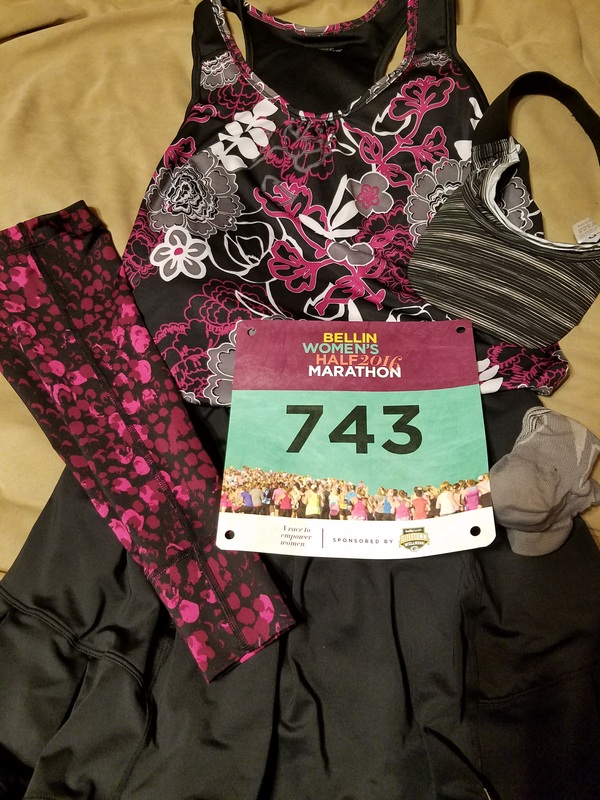 However, once I woke up, I figured I better add a pair of capri’s under my running skirt – remember, we are going to be running right along the lake! When I arrived at the park, it was still dark and we had a COLD wind off the lake. It was at that time that I was glad that I remembered stuffing my Bondi Band Running hat into my gear check bag. I needed something warmer than my visor today! The original plan was to stuff the hat and jacket into my bag before I checked it, but since it hadn’t warmed up at all (I think it MIGHT have even got colder) I opted to keep them on! As we all headed to the starting line, it was obvious that most of us were not planning on peeling off any more layers yet! We toed that start line it hoodies, jackets, hats, gloves and more! I think I even heard some people had hand warmers stuffed in their shoes! This is Wisconsin, and it is October, you never know what the weather will be, so I guess we shouldn’t have been too surprised! I know that I normally over dress at the beginning of a race and then after a mile or so, start dreading my clothing choices because I get too warm. Honestly, this didn’t happen until after mile 5! Once we got back to the main road, I pulled off the jacket and tied it around my waist. 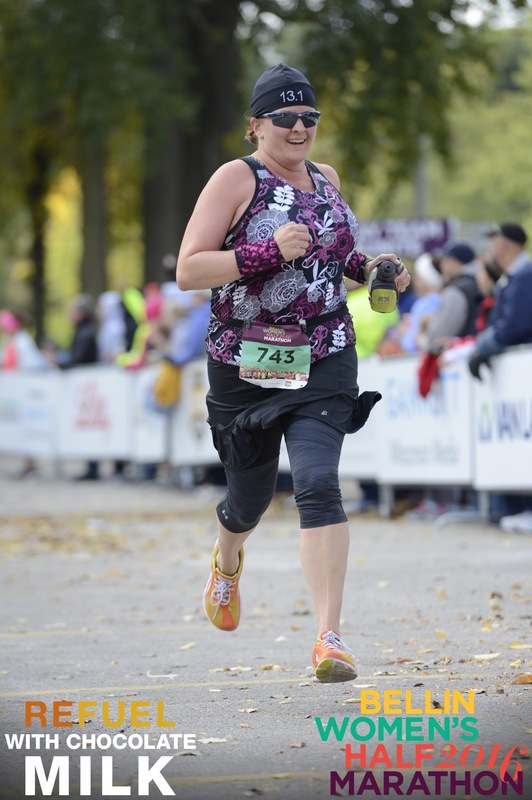 I did still have my arm warmers on, so I quickly realized that I was probably going to be warm enough to get me through the rest of the race. When I made it to the relay exchange/halfway point, I tossed my jacket to a friend to hang onto. I really didn’t want to deal with it around my waist for another 6.6 miles! One of the best things about this race is the course support. Most of the water stations are filled with volunteers who are either spouses or family members of those running, other amazing women’s organizations. There are hundreds of people cheering along the course and kids hanging out in their front yards giving high 5’s to runners as they pass! My favorite water station is at about the 10 mile marker. This was true again this year. 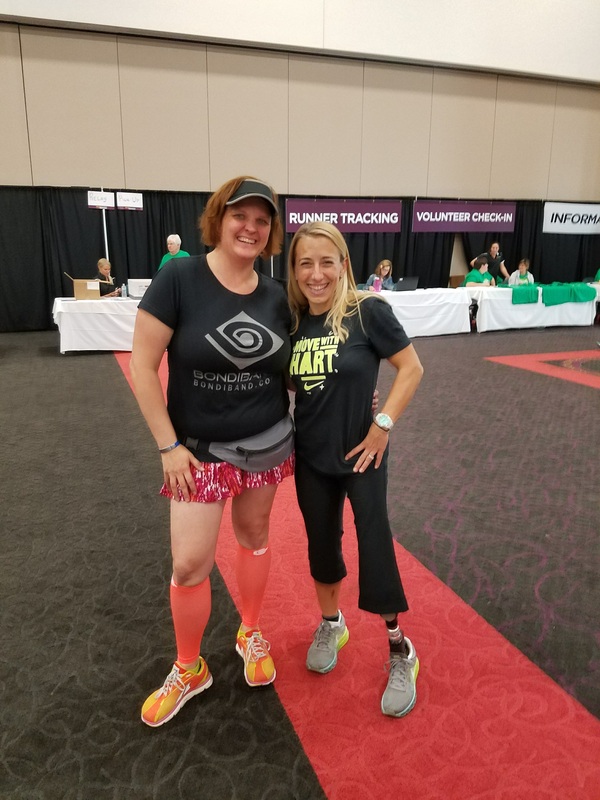 One of the volunteers at this station this year was actually my trainer… my coach… the one that pushed me for months to help me get to where I am! I grabbed water from Andy and pushed on. Not sure if there was something magic in that water, or the fact that the DJ was blaring awesome 80’s tunes, that next mile was my fastestof the morning! As always, the last few miles are when the body starts to question your sanity and you dig as deep as you can to push to the end. 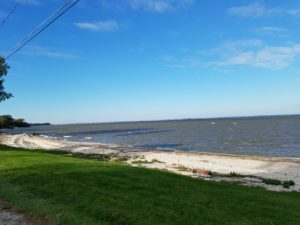 I can honestly say that when I headed into the parking lot at Bay Beach, there was not much left in the tank! 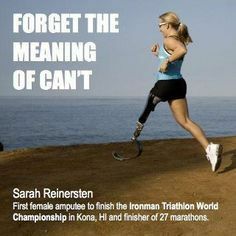 When I rounded that last corner, the only thing I saw was Sarah on the other side of the finish line, cheering me through those last strides! 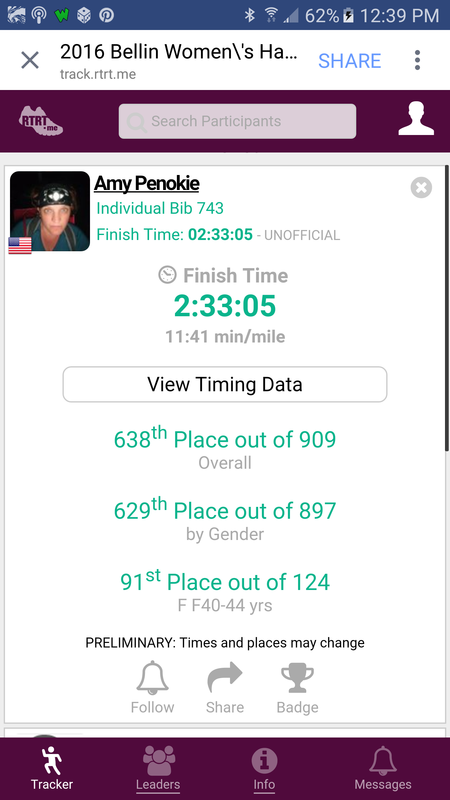 Yes, I was glad to be done and the awesome finishers medallions that are awarded to all those that cross that finish line are amazing, but nothing is better than getting a huge hug and congratulations from a legend in the running world when you finish 13.1 miles! Thanks Sarah! I was done. I was no COLD! I wanted food! Did I mention I was cold? Oh yeah, almost forgot! 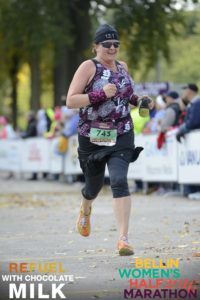 FREE race photo’s! Yes, this is by far one of the best perks that a race can offer! But in reality, the photographers do such an awesome job with this race, I would have probably paid for the pics this year 🙂 But I love the fact that they are free every year! Let the celebrating begin! This is not your usual post race banana and pretzel race! 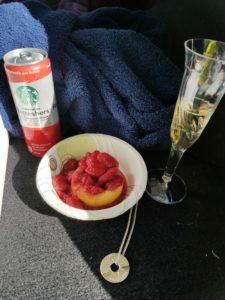 We are talking sparkling grape juice, gourmet brownies, strawberry shortcake, Starbucks Refreshers, ham or turkey wraps and so much more! 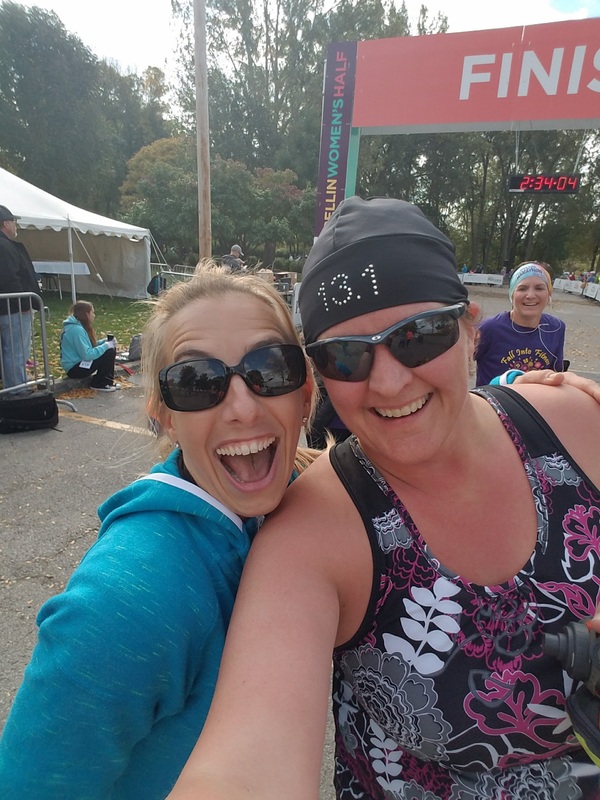 I normally stick around for a bit and celebrate with the girls, but once I saw Lisa cross the finish line, I headed to the car (Remember, I didn’t have my jacket anymore!). It was time to head home and warm up! Thank you once again to Linda and her crew for putting on a fabulous race! Already looking forward to next year! See you again in October! Who else is joining me?